By Katherine Doyle Sawyer Olmstead is buzzing about bees. Inspired by an Entomology class led by Dr. Chris Cutler, this fourth year Environmental Science student has uncovered a passion for bees. Drawn to the Faculty of Agriculture because of his farming background and love of soil Sawyer soon found himself drawn to these powerful insects. “I think a lot of people have a natural attraction to bees once they start learning about them, simply because they are fascinating,” explained Dr. Cutler, an Associate Professor in the Department of Environmental Sciences. A native of Truro, Sawyer was recently asked to take part in an international research project with the Organization for Economic Cooperation Development (OECD). OECD is an international cooperative effort that is attempting to determine toxicity standards for bumblebees. The tests were conducted in numerous labs across the globe, Dr. Cutler’s lab being one, which allowed Sawyer to conduct his research in Bible Hill. “A lot of research has been done in insect toxicology and the effects of pesticides on bees and honey bees, because they are more common,” Sawyer explained. “Everyone loves honeybees. No one has really looked at bumblebees or other bees that are not in the honeybee family,” he added. 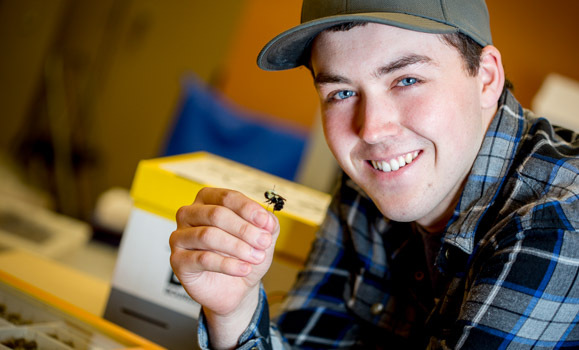 Sawyer is taking his research a step further by studying to see if low doses of pesticides can influence the longevity or survival of bumblebees which would be a beneficial response to pesticide. “High doses can kill them, but it is starting to be observed that in some instances, low doses of pesticides can have beneficial effects on some insects such as increased fertility or improving the overall fitness of the insect.” As part of this project, Sawyer will be in the lab checking the daily results of his testing for 21 consecutive days. Sawyer learned a lot from simply working and being on the Agricultural Campus. He gained knowledge on bees and beekeeping and was able to overcome and enjoy the challenges of beekeeping. After finding his passion for bees and having the opportunity to work with OECD through Dalhousie University, Sawyer plans to return to the Faculty of Agriculture in September to complete his Master’s degree under the supervision of Dr. Cutler. With graduation, commencement of his Master’s Degree, a budding business and much more in store in the coming years, Sawyer’s future is looking pretty sweet. Sawyer will be graduating with his degree in Environmental Sciences from the Faculty of Agriculture.